Allwood Sails is into skiff racing. 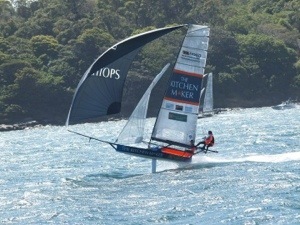 Joel makes competitive skiff sails at his Brisbane loft and Cam makes tapered halyards and ropes in his Sydney business. Brendan and Joel designed and built the Allwood Sails 12 foot skiff. Guess who makes the sails? 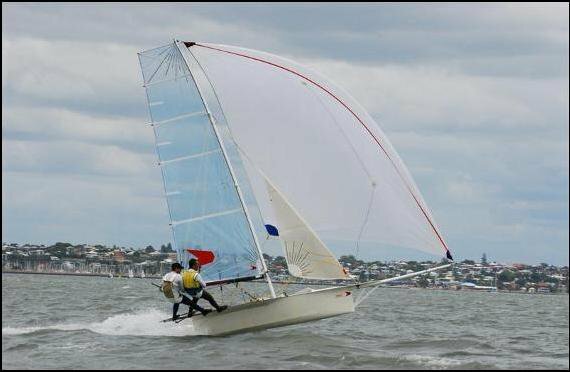 Joel, Cam and Brendan Matthews raced the Allwood Sails 12 foot skiff in the 2013 Interdominion Championship. Cam also raced the 2013 International 14 class Australian Championships with Dave Alexander (Alexander Sails) and filled in aboard the Bigfoot Bags & Covers skiff for a single race in the 2013 16 Foot Skiff Australian Championship. The next event is race The Kitchen Maker skiff in the 2013 18 foot JJ Giltinan Championship conducted by the Australian 18 Footers League in February. Joel is off to the Sports Boats Nationals next. And hopefully Brendan is designing another 12 foot skiff one day. The Kitchen Maker 18 foot skiff racing team in their second race. Malcom Page, Darren McKavanaugh and Cam McDonald.